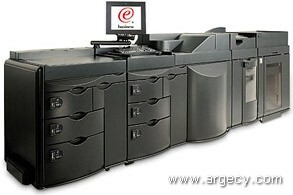 The IBM 2710 Model RP1 is a high speed multifunctional digital duplicator with upgradable features to include network connectivity and is aimed at the corporate reprographics centers, in-plant print shops and the print for pay market. Xerox Datastream Solution - TCP/IP and RJE (1st printer only) (feature #4233)- Selected to connect to a host system via TCP/IP or RJE using Xerox datastreams. The following table helps explain the relationship of the Xerox datastream PSOs. Base Data Center Publisher PSO (#4240) - This PSO is designed as a cost-effective solution using PCL and Postscript. Printer Solution Offerings (PSO) for the RP1One and only one of the following Printer Solution Offerings must be ordered for a RP1: #4210 and #4220. Intended for reprographics centers and print shop applications. It includes the microcode needed for standalone digital diplicator application. Prerequisites: Infoprint 2000 Model RP1. Maximum Number of Features: One per Infoprint 2000 Model RP1. Compatibility Conflicts: Cannot be installed with 4220. Intended for reprographics centers where an attachment to the corporate network is required. It includes the microcode for duplicator printer functions and LAN connectivity. Prerequisites: Infoprint 2000 Model RP1. Compatibility Conflicts: Cannot be installed with 4210. One and only one of the following Printer Solution Offerings must be ordered for a DP1: #4230, #4232, #4233, #4240, and #4250). Includes Networked Printer Microcode, System Control Subsystem (SCS), 512 MB Memory, Network connectivity, channel connectivity, Xerox Datastream Enablement. Prerequisites: Infoprint 2000 Model DP1. Maximum Number of Features: One per Infoprint 2000 Model DP1. Compatibility Conflicts: Cannot be installed with 4232, 4233, 4240, or 4250. Corequisites: The 4th Infoprint 2000 attached to the same host requires #4110 in addition to this feature. Compatibility Conflicts: Cannot be installed with #4230, 4233 4240, or 4250. Prerequisites: Infoprint 2000 Model DP1 that is the first printer attached by TCP/IP and RJE. Corequisites: Requires one from (#4121, #4131, #4135, #4165, #4191, #5121, #5131, #5135, #5165, or #5191). Compatibility Conflicts: Cannot be installed with #4230, #4232, #4240, or #4250. This feature provides an Advanced Function Common Control Unit (AFCCU) so that the Infoprint 2000 can print AFP/IPDS datastreams. This feature cannot be installed in the field, and is only valid for initial orders. Number of feature required: 0. Prerequisites: IBM 2710 Model DP1. Compatibility Conflicts: Cannot be installed with #4230, #4232, #4233, or #4240, or with the booklet maker (#4720, #4721). Corequisites: None. Compatibility Conflicts: Cannot be installed with #4230, 4232, 4233, or 4250. This feature provides a System/370 Parallel Channel Attachment when using IPDS. Maximum number of feature allowed: 2. This feature provides the ESCON Channel Attachment when using IPDS. The customer has the option of choosing one or two attachments when ordering the Infoprint 2000. The token-ring feature provides the native attachment of an Infoprint 2000 printing system to a LAN via Token-Ring when using IPDS. Maximum number of feature allowed: One of either 4121, 5121. Limitations: There can be one Token-Ring, and one ESCON, System/370 Parallel Channel, Ethernet (TCP/IP), or FDDI (TCP/IP) attachment. This feature provides the attachment of the Infoprint 2000 Printing System to a LAN via 10/100BaseT Ethernet (TCP/IP) when using IPDS. Maximum number of feature allowed: One of either 4165, 5165. Limitations: There can be one Ethernet (TCP/IP) and one ESCON, System/370 Parallel Channel, Token-Ring, or FDDI (TCP/IP) attachment. This feature provides a native attachment of the Infoprint 2000 printing system to a LAN via FDDI (TCP/IP) when using IPDS. Maximum number of feature allowed: One of either 4191, or 5191. Limitations: There can be one FDDI (TCP/IP) and one ESCON, System/370 Parallel Channel, Ethernet (TCP/IP), or Token-Ring attachment. The network connectivity option uses a 10/100BaseT Ethernet Network Interface Card (NIC) with a RJ-45 jack. Network protocol support includes TCP/IP, Appletalk, Ethernet, IPX/SPX. The channel connectivity option includes a channel controller standalone unit providing support for Xerox datastreams. It has connectors for channel Tag and Bus cables. Tag and Bus cables must be ordered separately for a connection to an IBM S/390 parallel channel. The Scan Station includes a scanner and the Infoprint Scan 2000 software. The RP1 comes with one standard Scan Station or Production Scan Station (#5290/5291). The RP1 and NP1 can accomodate up to a total of three stations in any combination of Scan Stations or Production Scan Stations. The Scan Station (#4290/4291) consists of an up to 20 PPM scanner with 300 DPI resolution and a SCSI card. Maximum number of feature allowed: A maximum of two features from the group #4290, 4291, 5290 and 5291 on an RP1. A maximum of three features from the group #4290, 4291, 5290 and 5291 on an NP1. Corequisites: Each Scan Station requires a dedicated Scan Station Controller (#4390/4391 or Customer Supplied) and an Operator Display Station (#4317/4318/4321/4322/4323 or 4324). Prerequisites: Model RP1 or NP1 only, this feature is not available for the DP1. Feature #4287 (Duplicator to Printer/Duplicator SW upgrade) is a prerequisite when installing on a RP1. Feature #4289 (Printer to Printer/Duplicator SW upgrade) is a prerequisite when installing Scan Stations on a NP1. The Scan Station Controller is used to control an associated Scan Station (#4290/4291) or Production Scan Station (#5290/5291). Each Scan Station and Production Scan Station requires a dedicated Scan Station Controller. Maximum number of feature allowed: A maximum of three on the RP1 and NP1. Corequisites: Each Scan Station Controller controls either a Scan Station (#4290, 4291) or a Production Scan Station (#5290, 5291). Prerequisites: Model RP1 or NP1 only, this feature is not available for the DP1. The Production Scan Station includes a scanner and the Infoprint Scan 2000 software. The RP1 comes with one standard Scan Station or Production Scan Station (#5290/5291). The RP1 and NP1 can accomodate up to a total of three stations in any combination of Scan Stations or Production Scan Stations. The Production Scan Station operates at up to 65 PPM simplex at 400 DPI by scanning both sides of a document at the same time. Each Scan Station and Production Scan Station requires a dedicated Scan Station Controller (#4390, 4391 or customer supplied). Maximum number of feature allowed: A maximum of two features from the group #4290, 4291, 5290 and 5291 on an RP1. A maximum of three features from the group #4290, 4291, 5290 and 5291 on an NP1. Corequisites: Each Production Scan Station requires a dedicated Scan Station Controller (#4390/4391 or Customer Supplied) and an Operator Display Station (#4317/4318/4321/4322/4323 or 4324). Provides an additional three-drawer paper input supply with a total capacity of 4000 sheets. Number of feature required: One if Signature Book Maker (#4720, 4721) is installed, otherwise zero. This feature provides the capability to attach up to three high-capacity output stackers. Without this feature, each printer can have only one high-capacity output stacker. More stackers reduces or eliminates stopping the printer to empty the output stackers since when one stacker is full, output flows to the next stacker. Maximum number of feature allowed: Two per Infoprint 2000 unless the Bookletmaker (feature number 4720, 4721) is also installed. Only two high-capacity stackers are allowed when the Bookletmaker is also installed, so the maximum number of this feature is one (1) when the Bookletmaker is installed. The Bookletmaker is available on the Model RP1. Prerequisites: Model RP1, DP1 or NP1. Limitations: Not available with IPDS (#4250). The Inserter Module allows for inserting preprinted items into the jobstream after the fuser station. This protects those items from being damaged by fuser heat. This includes an additional dolly used with the stacker to move large print jobs easily without the risk of papers falling. Maximum number of feature allowed: No limit. The Xerox datastream enablement includes software to convert the Xerox native data stream (LCDS/Metacode) to PostScript level 3. Included with this option is the software and installation. This feature is available on an initial order or MES on the RP1 model. It provides the microcode for an RP1 model with the Standalone Duplicator PSO (feature 4210) to add printer capability. Limitations: Available for RP1 only. This feature can be order on the initial order or as a MES on the NP1 model. It provides the microcode for a NP1 model to be upgraded from a printer only to a Printer/Duplicator. Limitations: Available for NP1 only. This kit includes all hardware to vent heat from the Infoprint 2000 to the outside.